Home » Perspectives Papers » Have Putin and Netanyahu Struck a Grand Bargain? EXECUTIVE SUMMARY: On July 8, Israel allegedly conducted an airstrike in Syrian territory that struck once again at the T4 base near Homs. Interestingly, Israel did not conduct any airstrikes to stop the concurrent advance of Syrian and Hezbollah forces southward. This might suggest that a grand bargain has been offered by Russia to Israel – one in which Moscow assures Jerusalem of an Iranian withdrawal in return for Israel’s acceptance of the consolidation of the Syrian state. This might explain Israel’s passivity, but it is by no means certain that Moscow will prevail on Tehran to withdraw from Syria. Israel allegedly struck the T4 base near Homs on July 8, but did not conduct any airstrikes to stop the advance of Syrian and Hezbollah forces southward from Daraa all the way to the Jordanian border, a mere twenty miles east of the Israeli Golan Heights. How could Israel be so forceful against a target over one hundred miles from its northern border and yet so passive as Syrian, Hezbollah, and possibly Iranian forces crushed the rebels and reconquered territory? Has Jerusalem not stressed time and time again that it will not allow the northern border with Syria to replicate its northern border with Lebanon, for which it has paid dearly for over two decades? 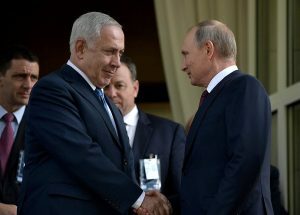 The meeting that took place between President Vladimir Putin and Prime Minister Benjamin Netanyahu a week after the Syrian advance might go a long way towards explaining Israel’s passivity. Russia might be offering Israel a grand bargain that Putin believes will meet the interests of both parties. the removal of the US presence and involvement in the southeastern area of al-Tanf. This presence is part of a campaign against the continued presence of ISIS, but it has also led to painful US airstrikes against Syrian and Hezbollah forces and US support for Kurdish forces along the eastern side of the Euphrates down to the Deir az-Zur area. Putin probably assured Netanyahu that once these foreign forces are removed, including the Turkish logistical lifeline it provides to the Sunni rebels in the Idlib area (the rebels’ last territorial stronghold), Moscow will make sure the Iranians and Hezbollah leave Syria as well. Putin likely stressed to Netanyahu that he has already committed himself to this bargain by taking a blind eye to the painful blows Israel has rained on Iran and Hezbollah in Syria. Above all, Putin likely told Netanyahu that Russia’s involvement in Syria, in utter contrast to his Communist predecessors (whom he of course served as a minor security official), will be a major actor in achieving regional stability based on territorial integrity, with each state – and each actor within each state – “persuaded” to honor the territorial integrity of the other states. According to such a vision, Hezbollah will finally settle down to being a “national” Lebanese party shorn of its theocratic and “resistance” mantle along with its militia. Iran will turn to its many domestic concerns. Syria will be hard at work coming up with a federal solution to meet the needs of its heterogeneous population – provided, of course, that the Alawite canton is assured of its stability, if only because Russia wants its naval presence in Tartus and its airbase in Khmeimim. Should this scenario come to pass, Israel would be the major beneficiary of a new order based on states and state actors minding their own business except for cross-border commerce that would augment regional stability. But why should Syria, Iran, and Hezbollah play the roles the grand bargain assigns them? After all, aren’t all three ideologically committed to the destruction of the Jewish state? Putin believes Damascus has no choice but to agree to cut ties with Tehran. The alternative is to risk being carved up by outside forces – Turkey, the US, and perhaps most menacingly, Iran, its presumed ally. Each will have the help of its respective proxies – the remnant Syrian rebels under Turkish influence; the Kurds, supported by the US; and Hezbollah and Iraqi militias in the service of Iran. Iran could agree to withdraw if it has internalized the lesson it has been taught over the past two years – the strategic use of air power. Russia’s successful use of air power turned the tide in the Syrian state’s favor against the rebels, and air power was used by Israel and the US to punish Iranian forces and allies. Their airstrikes might become more coordinated and deadly and might even be aimed at Iranian territory itself should Tehran continue to harbor imperial ambitions that clash with Moscow’s eagerness to broker stability in the area. Of course, the extent to which Russia can implement this grand bargain is contingent on the results of the meeting Putin will have with President Donald Trump in Helsinki on July 16. A clear American acceptance of Moscow’s primacy in the former Soviet republics, and the removal of all sanctions against Russia or Russians to prove that commitment, will be the major Russian demand. Yet even if these agreements – first between Putin and Netanyahu and then between Putin and Trump – come to pass, it is hardly assured that Russia will be willing or able to see the Iranians out of Syria. According to Michael Sharnoff, an expert on superpower relations with their Middle East clients, the Soviet Union scarcely prevailed in key Syrian decisions despite the massive economic and military support it gave the Assad regime. This included the decision to enter disengagement talks with Israel in 1974 without informing the Soviets. Maybe on the Golan Heights there were few problems, but Syrian aid to Hezbollah, Hamas, and other terrorist organizations was not only problematic for Israel for over three decades but was in fact deadly. Israeli passivity at the Syrian advance southward might prove in hindsight to have been at best a missed opportunity and at worst a major strategic mistake.